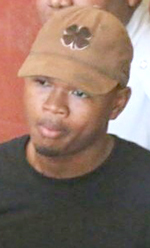 Two Detective Constables attached to the Bartica Police Station were yesterday charged and taken before Chief Magistrate Ann McLennan in the Georgetown Magistrates’ Courts for allegedly stealing $500,000 from a gold miner. 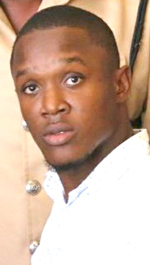 Delon Sobers, 24, of Soesdyke, East Bank Demerara, and Tevon Headley, 23, of Lot 39 Republic Avenue, Mackenzie Linden, were not required to plead to the charge which alleged that on October 11, last, at Bartica, in the Essequibo Magisterial District, stole $500,000 from Rayad Atkinson. Neil Yaris, the third detective who is accused of stealing the money did not show up in court for the charge to be read to him. The Magistrate after inquiring from the arresting rank why the number one accused was not present in court, he replied that all three of the accused men were on an open arrest and Yaris failed to show up at the Tactical Service Units (TSU). The accused men were represented by Attorney-at-Law Mark Conway. The lawyer told the court that his clients have been in the Guyana Police Force for several years. He added that the money was not found in any of his client’s possession, and since the incident occurred his clients were still conducting duty. Police Prosecutor Neville Jeffers made no objection to bail being granted to the accused men but asked that condition be attached. The Chief Magistrate, in return, ordered the men to post $70,000 bail each. Condition of the bail is that they are required to report to the Criminal Investigation Department (CID) Headquarters, Eve Leary every Friday until the completion of the trial. They were instructed to make their next court appearance on December 15, next, at the Bartica Magistrate’s Courts. According to reports, the victim who is the Operation Manager of his father’s gold mining business which is located in Karrau, Region Seven, was arrested by the three accused after his father made a report to the station stating that he stole his money. The victim at the time of his arrest was in a shop purchasing a phone when the three accused approached him and arrested him. The accused at the time of his arrest had a total of $1.2 M in his possession, money which he obtained from selling gold to his father. It was while he was being escorted to the Bartica Police Station that the trio conducted a search on him and found the money. He handed it over to them. While at the station it was observed that $500,000 was missing from the $1.2 M.